I trust you had a wonderful Christmas and are looking forward to the New year. Now, perhaps we can make 2015 even better for you! I have some very exciting news… in fact, it’s an especially exciting time of year! 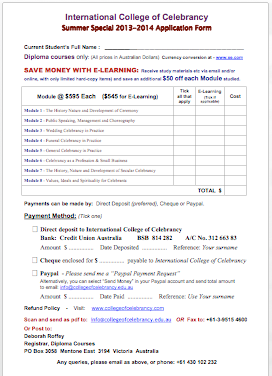 We have a very special offer for the Summer, which I wanted to share with you, personally. For a limited time only we are offering $100 OFF* All Modules!!! That’s a fabulous saving. 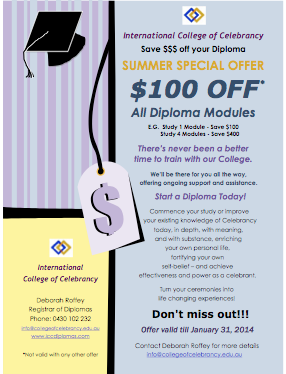 So if you would like to complete further modules or additional Diplomas with us, you can save $$$. The more you study, the more you save. E.G. 1 x Module, save $100. 4 x Modules, save $400. Please see the attached flyer for further details. This fabulous offer is for a limited time only, so don’t miss out! Any queries, don’t hesitate to contact me. Your application form is also attached. Hope to hear from you soon.